While those of us in the North Country are slipping on icy paths, my friend Bob, who lives in Virginia, is still blowing leaves off his lawn. Specifically, oak leaves. Every week Bob straps on his bright orange backpack leaf blower, mixes the correct amount of oil and gas and, with black hose in hand, ventures outside to do battle with the leaves. Actually, Bob loves to blow leaves and anticipates the annual autumn challenge. Yet now it is winter and he is still outside with his leaf blower. I once asked Bob why he never seemed to finish. Shouldn’t one leaf blowing escapade per season be sufficient? But then again, two giant oak trees dominate his lawn––and that presents a special problem. A word about oak trees. There are over 300 types, divided into White Oaks and Black Oaks. Within those categories there exist Pin Oaks, Bear Oaks, Scarlett Oaks, Shingle Oaks. The list is endless. 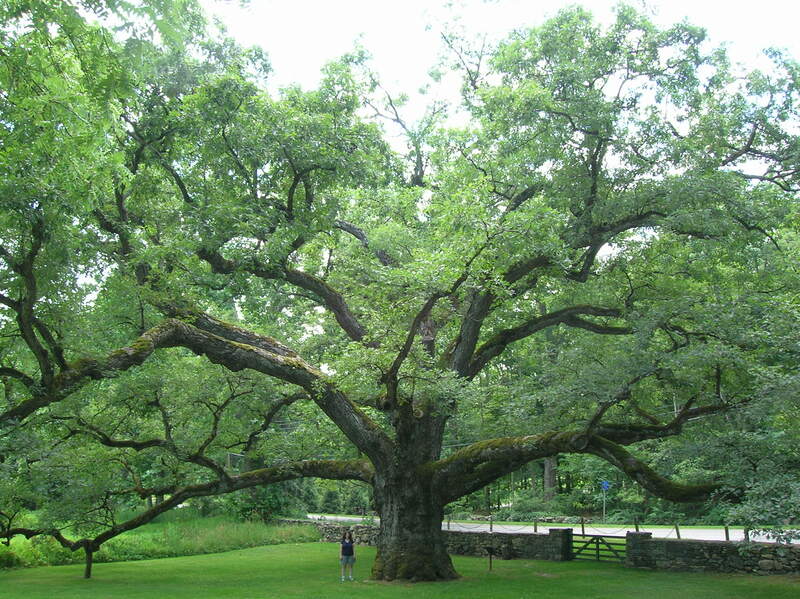 When I lived in Westchester County I would occasionally make a pilgrimage to the Bedford Oak, 500 years old. This tree is a real celebrity, deeded to Bedford’s founders by Chief Katonah in 1680. Chief Katonah was a powerful chief who even had a nearby town named after him, which, believe it or not, is called Katonah! The tree, 30 feet thick at its biggest girth, and with branches that spread 123 feet, gave shelter to George Washington when he passed through. Today the oak still attracts tourists. A question for trivial pursuit: In the 500 years that the Bedford Oak has existed how many acorns fell from that tree and how many nests provided homes for finches, blue jays, and other species that decided to dwell in the charming village of Bedford, New York? Whoever supplies the correct answer will receive 100 acorns or a pet squirrel. Perhaps, because of the Bedford Oak, and my interest in Indian Chief Katonah, I have a special fondness for oak trees—especially the oak tree on our point of land at Brant Lake. Only a little more than 10% the age of the Bedford Oak, our Brant Lake oak already boasts a distinguished legacy. Children climb the branches, squirrels gather acorns and scurry across the yard to hide their stores of winter food. A hammock seat, strung up on one branch, provides a haven to read, smoke a cigar and drink a scotch. Finally, the branches, extending over the water, offer shade when I relax in my canoe and cast for fish. A marvelous tree and only 450 years to go before reaching 500! So, what does this have to do with Bob’s red leaf blower and an oak tree? A simple answer. Unlike most trees, the oak drops its leaves gradually. 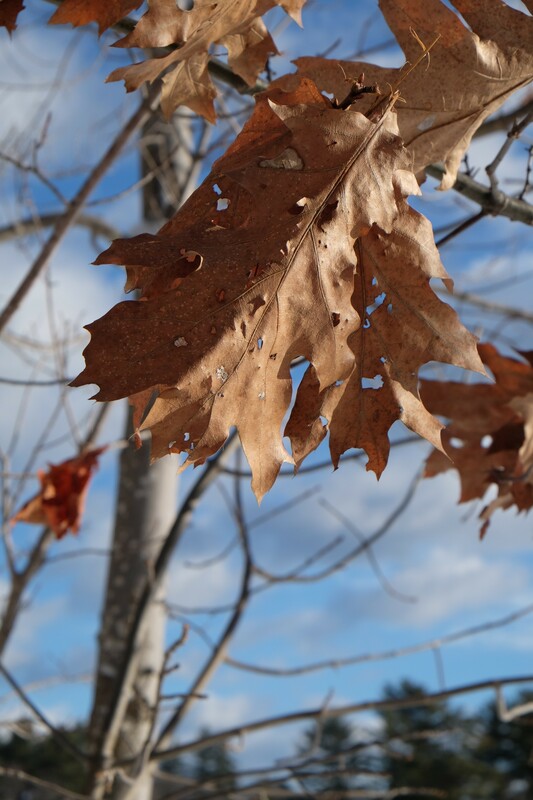 Sometimes, brown and crinkly, the leaves can hang on for the entire winter. Thus Bob never completes the task of blowing leaves off his property. The leaves just linger on the branches, drifting down when they are ready, one by one—or not at all. Poor Bob! A leaf blower’s job is never done. On the other hand, I admire the stately oak and, especially the leaves. They possess enviable staying power, reminding all of us that often life consists of just hanging on. And if you can’t hang on, then just hang in. Especially in the new year. Even if you are not an oak. January 15, 2017 in Brant Lake.